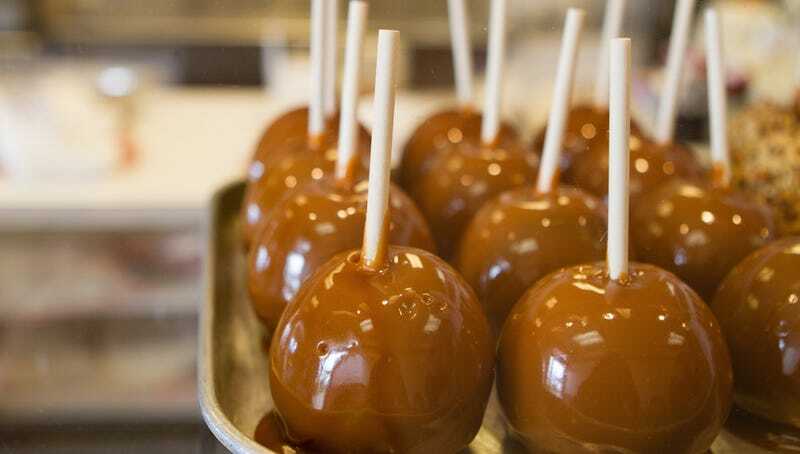 Caramel apples, which are not that good anyway, let’s be honest, have been linked to a 2014 Listeria outbreak that left seven dead and resulted in one miscarriage. Now, experts are urging fans of sugar-covered fruit on a stick to either eat the apple immediately upon purchase or to stick it in the fridge for later consumption. Anything else might lead to an unpleasant death. The study found that apples with dipping sticks inserted were much more likely to facilitate Listeria growth. The researchers believe that the act of inserting the stick causes juice to leak to the surface, which creates a microscopic environment between the caramel and apple where bacteria can thrive. When apples were left unrefrigerated, the researchers report, this growth happened even more quickly. So what to do? Aside from avoiding pre-packaged apples—did not know this was a thing—you can put your apples in the refrigerator or eat them immediately. You could also just substitute a regular apple for a caramel one because it will cut down on both your risk of Listeria as well as diabetes. But whatever you do, don’t just leave the apples out for a few days and then bite into them like it’s no big deal. It’s important to note that these apples in the study were deliberately covered in Listeria before being prepared. The bacteria have to come from somewhere, and if you’re using well-washed apples in a reasonably clean kitchen, there’s probably no reason to worry.